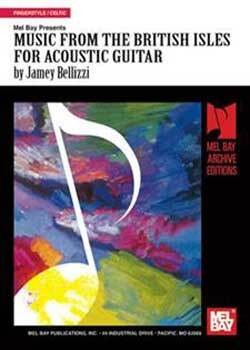 Jamey Bellizzi Music From The British Isles For Acoustic Guitar PDF + Mp3 CD download. A master solo collection by classic guitarist James Bellizzi containing 16 English airs and country dances; 21 Irish tunes by O’ Carolan and others; and 14 lively Scottish tunes and country dances. The arrangements capture the unique tone and spirit of these wonderful folk melodies and compositions. In notation and tablature. Mr. Bellizzi is an expert in instrumental music from before 1750 and is very active in expanding the repertoire for the guitar. He has published and recorded six anthologies that contain new transcriptions and arrangements for the guitar from the 13th to the 18th centuries. Jamey is also a composer for the guitar and his most recent original composition, “Serenate del Oro” has been selected for publication by the Guitar Foundation of America competition (1994). Mr. Bellizzi performs extensively and is a contributor to Acoustic Guitar magazine. Download Jamey Bellizzi – Music From The British Isles For Acoustic Guitar PDF free and other books from our site. Only high quality PDF scans. Please write a review, it's important for our community.